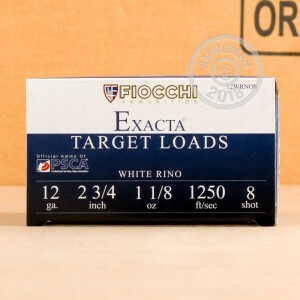 This 12 gauge shotshell ammo from Fiocchi delivers good patterning for sporting clays while producing 30% less recoil than full power loads. Each shell in this box of 25 fires a 1-1/8 oz. load of #8 birdshot at a muzzle velocity of 1,250 feet per second. This configuration produces only a slight loss in velocity compared to harder-kicking ammunition,and contributes significantly to better scoring for recoil-sensitive shooters. 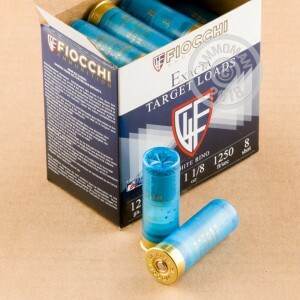 Fiocchi shotshell ammo is loaded at Fiocchi of America in Ozark, Missouri. Planning on shooting a lot of clays? Place an order for $99 or more at AmmoMan.com and drive your per-round cost down with free shipping!